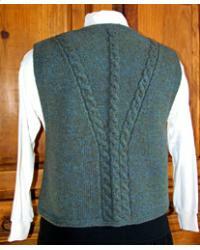 Knit in the round, this vest features an unusual cable pattern, v-neck and deep armholes. It can be dressed up or down to go with a wide variety of outfits. Many knitters consider this a unisex design.